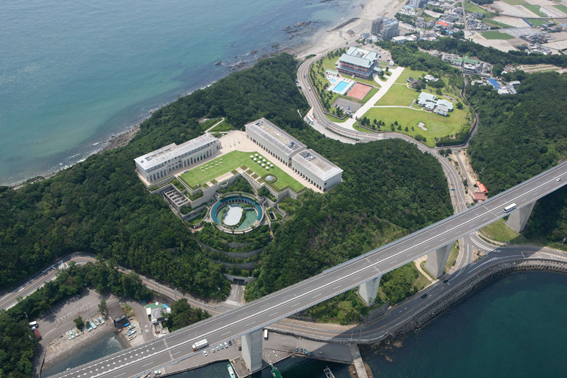 "Between East and West: Reproductions in Art"
A bird's-eye view of the Otsuka Museum of Art. Within the context of art, reproduction typically refers to creating multiple copies of a single design, and to the reproduction of artworks through the traditional manual techniques of woodcutting or engraving, as well as by modern photomechanical or digital processes. At this colloquium, however, reproduction will be interpreted in the broadest sense, encompassing the notions of copy, replica, remake (in the modern and contemporary sense), and even forgery (based on Cesare Brandi’s definition in his famous Theory of Restoration). Therefore, we can say that from antiquity onward, reproductions have contributed in different ways to the development of art and to the continuation and transmission of certain artistic ideas, styles, and techniques throughout history. Such is the case with Roman copies, for example, which played an invaluable role in the transmission of Western art, especially in terms of iconography and style. Despite the centrality of this issue, no international congress or colloquium held by CIHA has addressed reproduction in a comprehensive manner. One exemplary symposium outside of CIHA which addressed this issue, “Retaining the Originals: Multiple Originals, Copies, and Reproductions,” was held at the National Gallery of Art in Washington, D.C. The proceedings of this gathering were published in a special issue of Studies in the History of Art (Vol. 20 1989), and addressed various problems concerning reproductions in Western art. Following in the footsteps of the Washington symposium, this CIHA colloquium in Japan aims to further examine the issues concerning reproduction. It will include not only Western art but also that of Japan and East Asia, and encompass comparative and cross-cultural studies in art history. It is also intended as a continuation of the CIHA colloquium “Japan and Europe in Art History,” held in Tokyo in 1991, which also dealt with the issues of artistic exchange between Japan and Europe. Additionally, this colloquium will aim to reexamine corollary issues such as authenticity and originality, and to redefine these terms more clearly. Also subject to close scrutiny will be the tastes of individual patrons and collectors with regard to reproduction during different times and within different regions. The ultimate goal is to reevaluate the notion of reproduction and assess with greater precision its significance within the art of the past and the present. This colloquium is organized by the Japanese Committee for CIHA, the Otsuka Museum of Art, and the Japan Art History Society. It is sponsored by the Otsuka Fine Arts Foundation and the Kajima Foundation for the Arts, and supported through special collaboration with the University of Tokyo’s Graduate School of Humanities and Sociology.